Join Tobias Lars for 3 full Days of the 'Spirit of Peace' Manatee Swim Adventure and Course of Awakening Workshop. When you re-connect to a free (not domesticated) animal - when you connect with their spirit - they will help re-awaken that part in yourself - your freedom, your energy, your Spirit, your connection to all Life. At the same time you will help that animal's collective spirit trust us humans more and support the larger collective circle of Life of our planet. In Crystal River Florida the Manatees ‘winter’. It’s the best place on the planet to swim with these gentle mammals. Over 300 Manatees gather in the Crystal River bay. ‘The Three Maidens’ is the name of the crystal clear magical springs where we will swim with these emissaries of Peace and Gentleness.We will have a private pontoon boat just for our group. We will leave early in the morning and be back in afternoon. You will be able to easily get in the water and swim with the Manatees. You can choose to stay on the boat and watch them from there if you don’t feel comfortable in the water. Someone will literally take you by the hand and guide you in the water if you need it. Bring your own snorkel,mask, fins and wetsuit if you have them. Otherwise for about $20/day they can be rented easily right where we’ll launch from. Since we can’t control mother nature the amount of interaction and direct contact with the Manatees will vary. They are an endangered marine mammal and we can interact with them by touching and petting only if they initiate the contact. Manatees are curious creatures and often approach us for contact. With the right respect the Manatees respond to us. We had magical occurrences on last years trip. We had 2 females with babies play with us. The baby manatees came and gently rubbed up against us and allowed us to touch them. Nature responds when we are open. We are limiting the space to a max of 8 people so that we can offer a quality experience and interaction with the Manatees. In the evening we will meet and allow the days experiences to settle into us with wisdom and understanding about what the Spirit of Manatees is wanting to share with us. I recommend this Journey for anyone wanting more peace, more flow, more not getting triggered, stressed by the world around them. Someone wanting their world to flow more smoothly, more easily will benefit greatly from this trip. 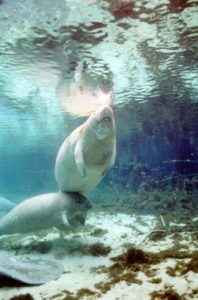 The reason I originally wanted to experience the wisdom of the Manatees was to allow, receive, accept the spirit of Allowing, Receiving, Acceptance into my life as an energy that would assist me in dealing with the world around me, in work, in personal relationships and with family. “Yield to overcome” is a saying among master martial artists. This is another way to describe the wisdom of the Manatees. CLICK HERE for more on Chassahowitzka River. What is the cost of the Manatee Swim Adventure? The ALL INCLUSIVE cost of Course Of Awakening Retreat and Manatee Swim Adventure is $1195. Can I arrange my own food and lodging? Yes you can arrange your own food and lodging. The cost of the Course of Awakening Retreat and Manatee Swim Adventure Only with Lodging and Food separate is $695. Can I cancel if need be? We would love to keep it absolutely flexible and be able to let people cancel at anytime but because of small groups and occasionally having to turn people away these are the policies we believe are fair. 90 days+ out: full refund minus $100 re booking fee which is applicable to any of our future SpiriTravel Eco Adventures. 60-30 days out: 1/2 refund and other half applicable to any of our SpiriTravel Eco Adventures. 30 Days or less out: full credit applicable for future SpiriTravel Eco Adventures. Note: if you or we find a replacement to take your space we will give you a full refund minus a $100 handling fee at any time. Do you run the Manatee Swim Adventures with private groups? Yes with 4+ PEOPLE you can CUSTOMIZE A TRIP! If you have 4 or more people and we can CUSTOMIZE A PRIVATE TRIP! Please email info at tobiaslars.com with your desired dates for details. The Manatee Swim Adventures run in Nov/Dec and Feb/March each year. A great video of swimming with Crystal River Manatees. The baby Manatee brushed up against the side of Anna’s leg. She started laughing. We all got in the water to join her. Joy had ‘adopted’ Manatees over the years and wanted to experience them for real in the wild now. We had been watching four adults and two baby Manatees from our pontoon boat in Crystal River Florida for awhile when Anna bravely got in the water to swim with them. We were pointing them out to her as she would slowly approach them and let them choose if they wanted to interact. Here in their feeding area the water was murky so we couldn’t see them easily underwater with our masks. We would see a manatee only 3 ft from Anna and point it out to her from our vantage point up on the boat, but when she would look underwater and not be able to see it. So we had to get in the water and trust that these large gentle mammals also known as ‘sea cows’ would be gentle with us. The Mother Manatee was trusting her baby to come over and interact with us. I got in the water and walked slowly over in her direction. I stood still for a minute and I felt something brush up against me…I shivered and let out a ‘Wow!’ and started laughing. There was something amazing about trusting a wild free animal that I couldn’t see come up and brush against me. This is what I had felt that I wanted to learn more about…how to let ‘the world’, something free, strong & wild come to me and that I would be able to allow it, and trust it, be able to let it in. I felt shivers up and down my body, and I couldn’t help feeling happy and enlivened. I had felt that there was something that the Manatees had to share with me that would be helpful for me. I had an idea that it was something about acceptance, allowing life, not ‘fighting back’, something about ‘turning the other cheek’ but in a real practical powerful way that would help me in the ‘real world’. Joy and I had gone the week before to swim with the Manatees. We had anchored our pontoon boat, gotten in the waist high water and swum over to the entrance to ‘The Three Maidens’, the crystal clear springs that gives the name to Crystal River, and as we swum up the narrow channel into the springs a mother and her baby were swimming out! We had to share the stream and passed within a foot of each other. We reached out and felt the mother. How sweet, how trusting she was. It was like a fairy landscape in the springs. Amazing clear water, sunlight filtering through the trees and playing in the water. Fish, cormorants, the resting manatees, the quiet, the deep springs. The quiet was still palpably present even though people were swimming in and out to see the manatees. It was like the hush in a great cathedral. We later sat on a fallen tree log by the far spring lagoon and just ‘felt’ the magic there. A week later when we brought Anna to see the Manatees both Joy and I thought that the ultimate experience would be in the magic springs again and that we should head straight there. But when we arrived there were no manatees at the springs! Not a single one. This made no sense. (It was ‘after the season’ in late March) The guides and dive shop owners didn’t understand it either when asked later. But my intuition said to just accept it and go with it and we lifted our anchor and headed out into the bay. I felt to pull into a little spot on a little island. From there we saw some other boats back in a off the main route cove….followed that hint…and we turned the engine off and drifted as we saw several manatees cavorting, playing with their babies…and we got to spend an hour in the ‘wild’ with the two mothers their babies and a large male manatee. Anna later said – “That’s what I really wanted, I wanted to see them in their natural feeding places out in the wild.” She got exactly what she wanted! And we all know that if we really ask we get what we ask for! Along the western coast of Florida the West Indian Manatee gathers in large numbers to ‘winter’. 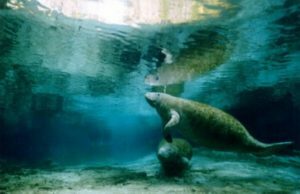 Crystal River and Homosassa Springs are two of the main areas the Manatees congregate. Manatee’s are a gentle sea grass eating mammal that the Indians honored. The Three Maidens are three springs where the Manatees come and rest. The pictures above are taken in those three springs.